Growing Worker Shortage Looms Over Logging Industry's Future Logging is dangerous, arduous work, and fewer young people are pursuing it. Logging groups hope more outreach, and a bill that would lower the minimum logging age, will help keep the industry going. 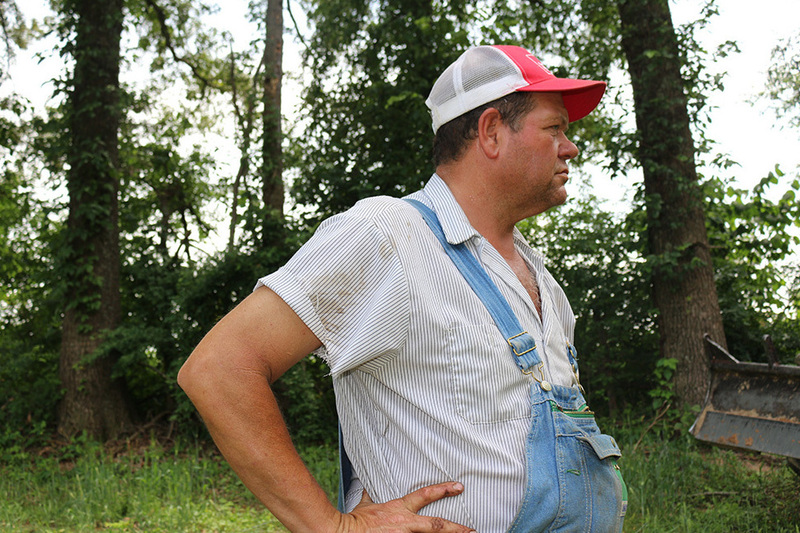 Michael Redfern's family has been logging Tennessee forests for four generations. But it's hard, dangerous work in a volatile industry, so fewer young people are pursuing the trade. Timber is big business in Tennessee. About $1 billion worth of the state's tree products is shipped abroad every year. But within the industry, there is concern that there may soon be too few loggers to keep the profession going. The Redfern family has been working the state's forests for four generations, but it isn't sure it will see a fifth. Michael Redfern, 57, runs a three-man operation with his two sons on a 25-acre property in Cedar Hill, near Tennessee's northern border with Kentucky. "Well, I'm not bragging or complaining. But around Robertson County, if you mention the word 'logging,' the Redfern name comes up a lot, because we've been in it a long time," he said. Michael's son Jonathan saws, Justin drags the trees out of the woods with a skidder, and Michael drives the logs to the mill. The 100-foot cherry tree the Redferns have just felled could fetch up to $400 at the mill, but landowners generally collect only half of that. 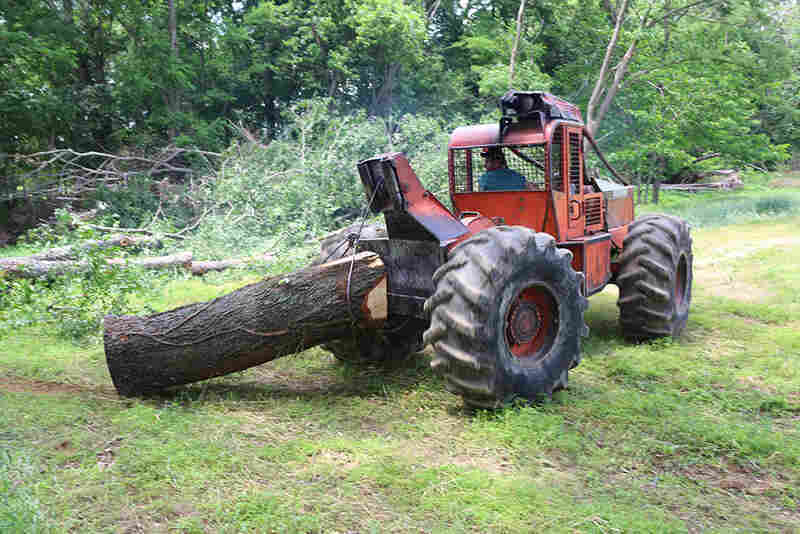 Justin Redfern drags a fallen tree out of the woods using a skidder. Logging is risky work; it accounted for more occupational deaths in the U.S. last year than any other industry. "People think we're sitting on a gold mine over here, but all we're doing is making a living," Jonathan says. "And we're fine with that. I enjoy it. We're middle class at best. We just make a living here. But it'll wear you out." Logging is also perilous. It accounted for 62 deaths in 2012 — more than any other industry in the U.S.
"A lot of times, if you get in a tree and it's bad in the middle, you're not holding anywhere. So when you start cutting, at some point, it's going to do what it wants to do," Jonathan says. The 29-year-old says he has a "pretty good three-step quick jump" to get out of the way of a falling tree. And logging isn't just dangerous — it's economically volatile, too. "The wood industry is unstable," says Adam Taylor, who studies wood products at the University of Tennessee in Knoxville. "It's a commodity industry, so it goes up and down, and you have to be able to weather those ups and downs." Jonathan also says the work takes a physical toll. "My dad's 57 years old and takes a handful of pills every morning just to walk," he says. "And some day, I'm gonna be the same way if I cut timber every day for 30 years. It just ain't for me." So Jonathan is looking for another job — one not in logging. And he's likely not the only one. Federal labor figures show that the logging workforce is aging, and many workers are not expected to be replaced. In turn, mills are sponsoring youth outreach events, forestry groups are organizing classes, and technical colleges are adding logging to their curricula. Even Congress has jumped in. Rep. Raul Labrador of Idaho has introduced a bill that would allow loggers' kids to use heavy equipment even if they're under the mandatory minimum age of 18. "I think if we continue to make it more difficult for young people to get into this field, and we continue to make it more difficult for the logging community to actually do their work, I think we're gonna see these jobs actually lost," Labrador says. Daniel Dructor, spokesman for the Texas-based American Loggers Council, which pushed the bill, says his group has lobbied Congress on the issue for years. But, he says, even legislation might not help. "The parents just aren't encouraging their kids to go into the profession anymore. They're looking for them to do something that they might make a better living at," Dructor says. Back in the forest, Jonathan says he won't be encouraging any young people to take up logging. "I'll say stay as far away from it as you can get," he says. Yet Justin, 30, plans to stick with the tree business — so long as he can find someone to replace his brother. "You can find a truck driver — that's not hard. The hard thing is gonna be finding somebody to run that saw," he says. Justin says not just anyone can take down a towering hardwood. Logging is a trade that, until now, most people were born into. But it's one that takes a toll, and for that reason, their dad says he can't blame his sons for wanting to take another path. The audio version of this story, as did a previous Web version, incorrectly states that logging accounted for 64 deaths last year. In reality, there were 62 logging-related deaths in 2012, the most recent year for which data are available.